What Is 'Natural' IVF, and Should You Try It? A new study looks at the effectiveness of doing IVF with no meds—but natural doesn't necessarily mean better. When I got the call from the nurse at my fertility clinic, I was in shock: My ovaries, which had been acting more like those of a 43-year-old than a 33-year-old, had made an egg. All on their own, with no drugs. The suggestion of my doctor shocked me even more: He wanted to perform in vitro fertilization (IVF) on me by taking out the single egg, fertilizing it in the lab and then putting it back into my body, where it would hopefully grow into a baby. Skeptical at first but eager to move forward, I went for it—and got pregnant. Although I later miscarried, I was amazed that I was even able to undergo the procedure in the first place. Up until that point, I had had no response to the fertility medications. Turns out, maybe I didn't need them. What my doctor performed on me is what's called "natural" IVF. And it turns out, natural IVF is very similar to the first successful IVF case. 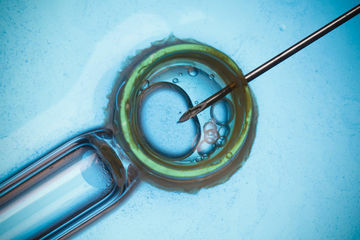 "The world's first IVF baby, born on July 25, 1978, was born after a completely natural cycle, where the woman was allowed to ovulate naturally and the doctors went in and got out the egg just before she ovulated," says Richard Paulson, MD, the director of USC Fertility in Los Angeles. The egg was fertilized in the lab, and the resulting embryo was returned to her uterus to become a baby. "Gradually people realized that if you stimulated the ovaries [with medication] that increases the efficiency of the process, because instead of just going into the ovary for one egg you have the opportunity to get many eggs," Paulson says. That's how most IVFs are done today—you get more bang for your buck because the more eggs, the more chances for a baby. Recently, though, going old school has been gaining popularity. Why? Some women, like me, don't respond well to the medication. Some respond too well, putting them at risk for ovarian hyperstimulation syndrome (OHSS), which can be deadly. Plus, the meds are super expensive. Paulson says all of these are reasons to go natural. Doctors originally thought that the naturally selected egg your body ovulates each month may be somehow better than those produced by drugs—another potential benefit of using natural IVF. But a new study from Reproductive Medicine Associates of New Jersey (RMANJ), published in the journal Fertility & Sterility and presented at the annual American Society of Reproductive Medicine (ASRM) conference this month, debunks that theory. The researchers used new technology to accurately test the embryos' genetics to make sure they were all good—and they were. "The rates of abnormalities in the embryos that were made were the same, whether the embryos were created in natural or stimulated cycles," says study author Kathleen Hong, MD. "Our research showed that not only do natural cycles and stimulated cycles create eggs that had the same chances of delivery, but that natural cycles create far fewer chances of delivery." Putting all your eggs in one basket? Hong argues that the benefits of traditional, medicated cycles are greater because with more eggs come more opportunities to make a baby—especially since any "leftover" embryos can be frozen for future attempts in case the first one fails. On the other hand, "natural IVF is a 'one egg, one shot' opportunity," she says. Even for poor responders, Hong says, "I would not recommend a natural cycle because the odds of pregnancy are so exceedingly low that I do not believe that the emotional, physical and financial burdens of treatment are justified." Other treatment options, like using donor eggs from another woman, would be more likely to result in a baby. But Paulson has a different opinion. "Yes the stimulated cycle is more efficient, and it does not do any harm to the egg—I completely agree with that—but that's not the only reason to do a natural cycle," he says. "There are other legitimate reasons for wanting to do a natural cycle: avoiding the medications, the cost of the medications and, let's be truthful, some women don't respond to the medications so why should they bother?" Plus, he says the financial argument against going natural—that it actually costs more because you'll need more tries for it to work—doesn't hold water. In research to be presented at the ASRM conference, Paulson and his colleagues performed a cost analysis of the natural versus traditional methods. "We surveyed the surrounding programs in terms of how much they charge, and we argued that it is in fact cost effective to do a natural cycle," he says. He also says that natural IVF isn't necessarily a one-shot deal. "People assume there's only one big follicle [that releases an egg], but there are also a lot of little follicles in the ovaries, and you can get eggs from those secondary follicles—they're immature and they mature in the lab," he says. This new technology, called in vitro maturation (IVM), is not yet available at every clinic, but could be another option. So which path should you try? For most women, traditional IVF is probably going to be best, and RMANJ's study shows it to be safe and effective. But if the medications are a barrier to your success, natural IVF may be an option.